Data: 128 paintings by Piet Mondrian (1905-1917); 123 paintings by Mark Rothko (1938-1953). Mapping: The two image plots are placed side by side. In each plot: X-axis: brightness mean; Y-axis: saturation mean. visualizations and text: Lev Manovich, 2009-2011.
original concept: Chanda Carey. Mondrian images scanning: Xiaoda Wang. All visualizations are created with free ImagePlot software developed by Software Studies Initiative. Mondrian's image set and data used in the visualizations are distributed with ImagePlot software. Visualizations use measurements of images visual characteristics obtained the tool included with ImagePlot software. We have selected particular periods in the career of each artist which are structurally similar. In the beginning of a period each artist was imitating his predecessors and contemporaries. By the end each artist developed an original visual language - a unique cultural "brand". In between, each gradually moved moved from figurative representation to pure abstraction. Mondrian's paintings illustrating the changes in his art during selected period. Left: 1905; middle: 1909; right: 1917. 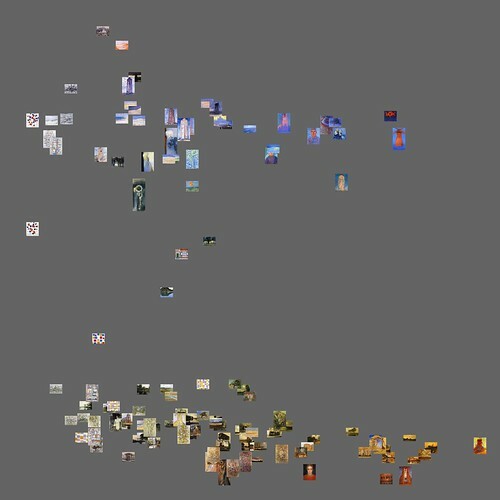 The left visualization above shows 128 paintings by Mondrian; the right shows 123 paintings by Rothko. The paintings are organized according to their brightness mean (X-axis) and saturation mean (Y-axis). Projecting sets of paintings of these two artists into the same coordinate space reveals their comparative "footprints" - the parts of the space of visual possibilities they explored. We can see the relative distributions of their works - the more dense and the more sparse areas, the presence or absence of clusters, the outliers, etc. The visualizations also show how Mark Rothko - the abstract artist of the generation which followed Mondrian - was exploring the parts of brightness/hue space which Mondrian did not reach (highly saturated and bright paintings in the upper right corner, and desaturated dark paintings in the left part). Another interesting pattern revealed by the visualization is that all paintings of one artists are sufficiently different from each other – no two occupy the same point in brightness / saturation space. This makes sense given the ideology of modern art on unique original works – if we are to map works from earlier centuries, when it was common for artists to make copies of successful works which were considered to be equally valuable, we may expect to see a different pattern. However what could not be predicted is that the distances between any two paintings which are next to each are similar to each other – i.e., while each image occupies its own unique position, its not very far from its neighbours. This visualization reveals another interesting pattern. Rothko starts his explorations in late 1930-1940s in the same same part of brightness/saturation space where Mondrian arrives by 1917 - high brightness/low saturation area (the right bottom corner of the plot). But as he develops, he is able to move beyond the areas already “marked” by his European predecessors such as Mondrian. Another way to represent development of an artist's visual language over time in 2D dimensions is by adding animation. The following animated visualizations plots Mondrian's paintings (left) next to Rothko (paintings). Each of the plots uses the same measurements for X-axis and Y-axis as the visualization above (X-axis = brightness mean; Y-axis = saturation mean). The paintings are plotted according to their dates. We selected the same number of paintings for two artists, so the two animations will finish at the same time. Here is another example of the use of animation to show patterns in time. Mondrian's paintings are plotted sequentially according to the year when they were painted; the year is shown in the upper left corner. (Note: Since we don't know the exact dates of the paintings, a particular order used to render paintings in each year is not important.) 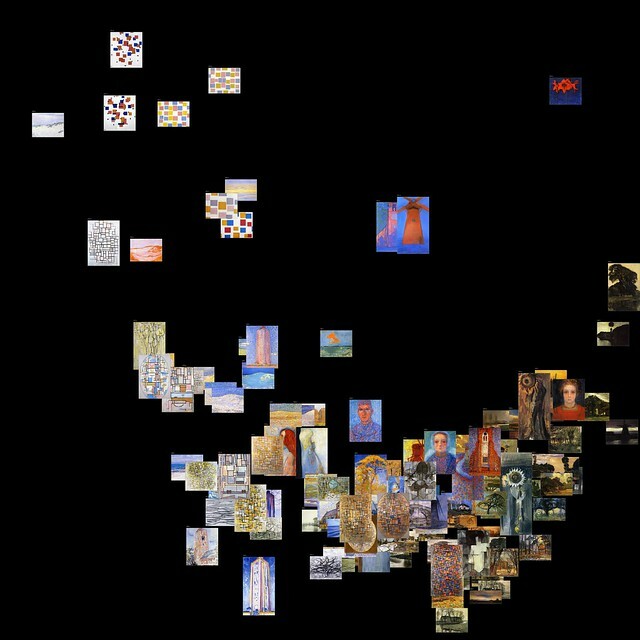 Visualization uses a standard statistical technique called PCA (Principal Component Analysis) to project 60 different visual features calculated over each of Mondrian's paintings into new dimensions. (PCA_1 is mapped into X, and PCA_2 is mapped into Y). As previous visualizations, this animation maps visual similarity into distance. However, now distance codes similarity not along a single visual dimension such as brightness or saturation, but along dozens of dimensions combined together. Digital image processing allows us to measure images on hundreds of other visual dimensions: colors, textures, lines, shapes, etc. In computer science, such measurements are often called "image features." Although an average of all pixel's hues may seem like a strange concept, this feature measurement turns out to be quite meaningful: it reveals that almost all of 128 Mondrian paintings created between 1905 and 1917 fall into groups: whose dominated by yellow and orange (bottom) and whose dominated by blue and violet (top). We can also create a similar visualization for Mark Rothko's paintings and compare the two visualizations. Mondrian's paintings are on the left; Rothko's paintings are on the right. Surpisingly, Rothko's works created during a period of a similar duration (Mondrian: 1905-1917; Rothko: 1939-1952) turn out to form rather similar clusters in saturation/hue space. Ryan Andrews wrote a very thoughtful and detailed response to our Mondrian/Rothko visualizations. But I made a song called Mondrian vs. Rothko in 2009, released it at the same time as you did this piece. Really enjoyed you article here, I was taking the facts from abstract square waves and trying o do a comparison.